Zentangle 9: Adding Beautiful Colors with Mixed Media. Amazon offers price guarantees. When the item ships if the price drops below what it is when you ordered, you are guaranteed the lower price. “Bring your tangle designs to life with brilliant color! 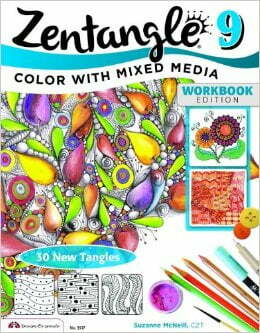 Inside you’ll find 31 all-new tangles with inspiring ideas for adding expressive color to your tangle art. You’ll love these easy and beautiful techniques for combining cool colors with mixed media.